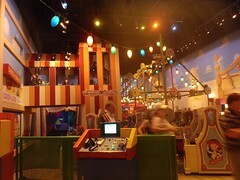 The Toy Story Mania ride itself is pretty much the same as at Disney's California Adventure, but the queue and loading area is much different. The queue is so much fun to walk through with it trying to give you the impression of being toy size in Andy's Room. 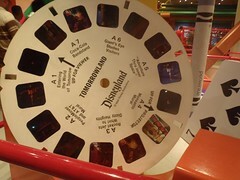 There are a lot of different toys and such around including a giant Viewmaster, a Lincoln Log cabin, and of course the talking Mr. Potato Head. It is nice that it is mostly inside and much more interesting than in California, since it can be a long line. The wheelchair loading area also separates at a different point than in California. In Florida, the stairs are before you get on ride instead of at exit, so you end up going off to a ramp to the wheelchair vehicle loading area. However, the wheelchair loading area is not as nice as in California. In California, there is a long bench for you to sit on as you wait for the wheelchair vehicle to come around and it to be your turn, but there is not one in Florida. Not a big deal, but it is kind of nice when you sometimes have to wait for the wheelchair vehicle to go out and come back a few times for your turn. 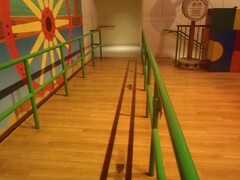 The wheelchair vehicle is the same, but it was our first time with the new system of having tie downs in the wheelchair vehicle for Toy Story Mania. I guess a lot of people had problems of tipping back some when riding, which makes sense as the ride is kind of jerky, but surprisingly Mik has never had that problem, as he freaks out on buses with tie downs and any tiny movement. He actually hates the addition of the tie downs. Mik was quite annoyed that it took them about 10 to 15 minutes to get the tie downs clipped onto his wheelchair. I barely convinced him to go a second time later in our trip by telling him they are still new to this with the tie downs being a recent addition. Luckily, the second time the CMs were better at finding the places to clip onto his chair. However, after our August 2011 trip to Disneyland we have realized the problem is them never seeing Mik's chair design as in Disneyland they ended up calling who we think was the supervisor to do the tie downs (the next day he came out to do it right when we started loading), but that only took about 5 minutes because they quickly realized it was better to just ask someone more experienced than figure it out themselves. Now I also know what spot to tell them to use with the size hooks they use.